A wooden robot toy stimulates imagination and creativity, particularly in younger children who may struggle with the more advanced robotic toys available to buy today. 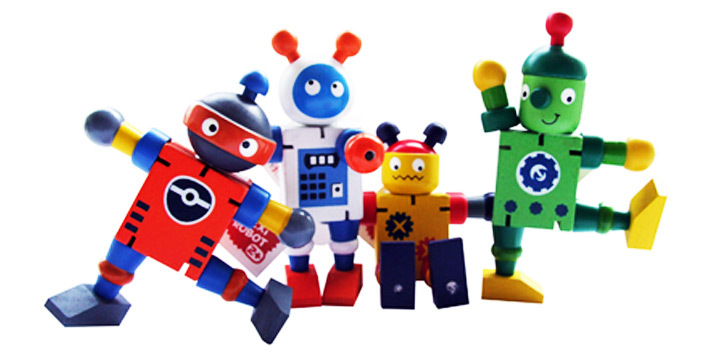 Colourful, safe and highly tactile, wooden robot toys are designed to be handled, manipulated and played with, just like the old fashioned toys many parents will remember from their childhood. Designed by innovative toy designer David Weeks, who was inspired by popular Japanese Shinto Kumi-ki (interlocking puzzle, in English) wooden puzzle games. 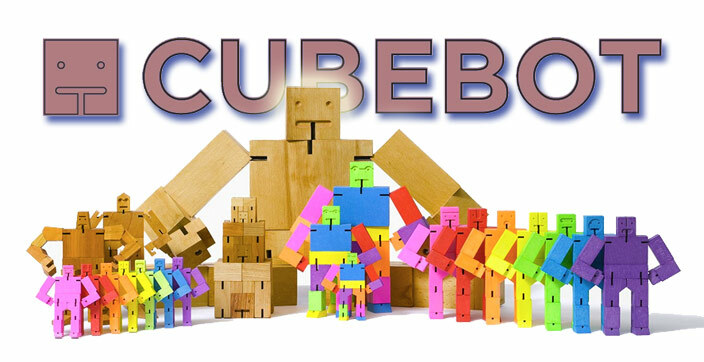 The impressive Cubebot manages to combine all the playability of traditional wooden toys with an intriguing, mind bending puzzle, which will keep both children and adults amused for hours. Cubebots powerful Beech Wood outer frame can hold a multitude of different poses thanks to his elasticated muscle system and when you have finished playing you can fold him up into a perfect cube, well, if you can figure out how to do it. No batteries required, a no nonsense, fun robotic game for children of all ages, available in micro, small, medium and large sizes. 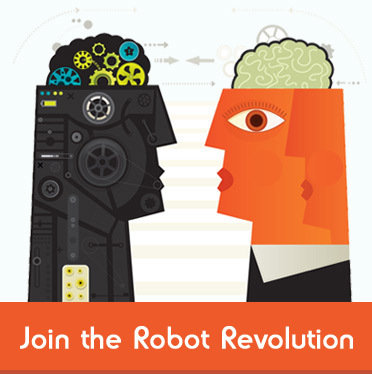 When is a robot not a robot? When it’s a Transformer robot of course. 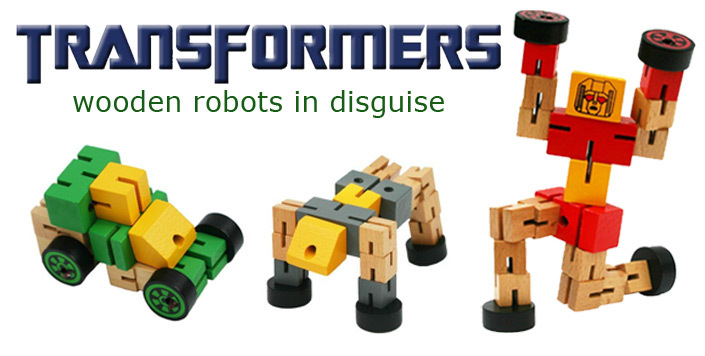 Based on the characters from the Transformer movies, these well crafted wooden robots can transform into cars, animals and of course powerful robot action figures. Improves hand, eye coordination and helps children develop concentration, perseverance and patience. Created from natural smooth wood and finished with non-toxic, environmentally friendly paint. A simple but engaging stacking and balancing game for the the whole family. 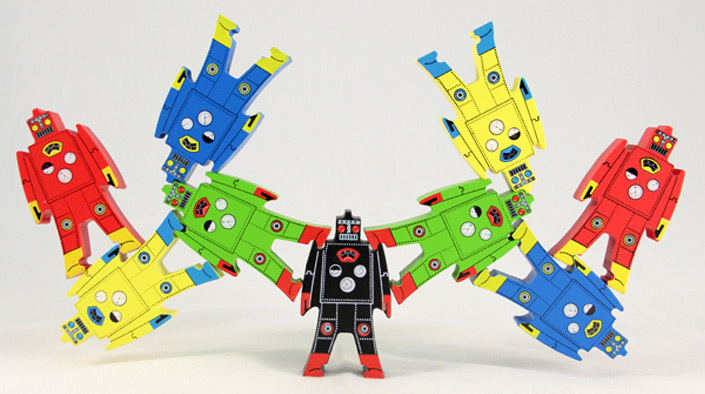 These brightly coloured wooden robot shapes are designed in such a way that they can be connected to form a variety of impressive formations, that require skill and patience to get right. Each pack contains nine figures but if you want to create bigger more impressive formations, two or more packs are recommended. No messing with batteries, screwdrivers or complicated instructions, these wooden stacking robots are immediate, highly addictive fun for children and adults of all ages. 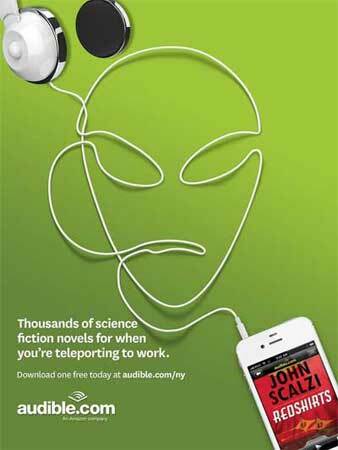 The perfect stocking filler for any robot mad toddler. These cute little robot figurines stand at around four inches high, perfect for little hands and are fully poseable yet strong enough to take the kind of punishment only small children can dish out. 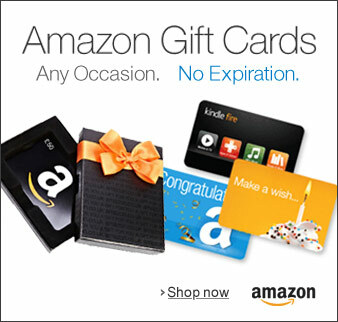 Available in six different designs, why not collect them all?